Today is the first day of a two-day Design Summit @AK12DC. Click here to follow Atlanta K12 Design Challenge. Eighty-five teachers from eleven schools are participating in a two-day summit using design thinking to address a critical issue facing their school. The project began five months ago with training of eleven facilitators, one from each school, in the methodology of design thinking. Under the guidance of Scott Sanchez (@jscottsanchez), a fellow from the Hasso Plattner Institute of Design at Stanford University, facilitators learned about using design thinking as a process for problem solving. The facilitators, working with their administration, selecting a team of teachers from the school that became the “school’s design team.” School teams were trained in design thinking at a daylong workshop in mid-January at First Data. 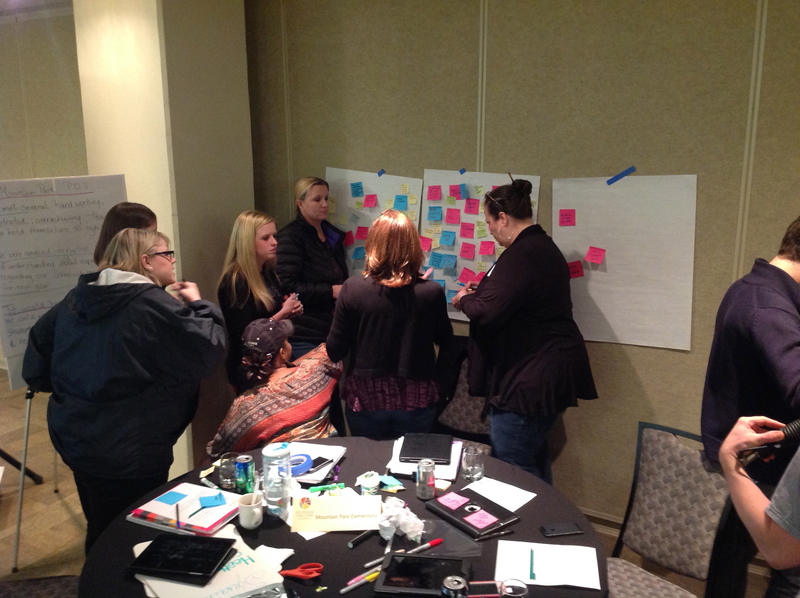 From mid-January through mid-March, school teams worked on the empathy phase of design thinking. They came up with some challenges their schools faced, focused on one or two, identified some users (students, teachers, parents, etc.) and carried out user interviews to collect data. After empathy, they analyzed their data looking for themes, patterns, and insights into their user and the school challenge on which they were focused. Their goal was to create a series of “point-of-view” statements that would become the foundation on which a prototype would be built. The prototype, in its early phases would be low resolution and life-size, and morph into a model that they can test in their schools as a way to “solve” the school’s challenge. The Design Summit on March 21 and 22 is the event that culminates the first phase of @AK12DC. Today’s energy in the room is electric. Lots of creative ideas demonstrating the ability of teachers to tackle complex school challenges and collaborate with peers on solutions that are interesting and viable. In Phase II, we will support school teams as they implement their prototype in the 2014-2015 school year. Phase I was supported by the R. Howard Dobbs Foundation. We (Center for Teaching & Reimagine:Ed) are in the midst of collaborating with the Dobbs Foundation, The Westminster Schools, and The Lovett School to raise the funds to continue our work with @AK12DC. Look at the hashtag #AK12DC to follow the stream of tweets coming from the summit on March 21 and 22.